There's a new hymnal recently out for we Prez-bee-teer-yans, one I've heard the rumblings of for a couple of years now. Within my own teeny tiny church, folks have been asking when and whether we might be making that shift. Honestly, I don't know. 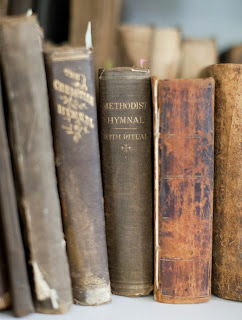 The whole idea of hymnals in this era continues to strike me as a tiny bit strange and a tich archaic. I mean, shoot, I love so many of the old hymns, but the hymn as a modern musical form? Hum. More new hymns? I just, shoot, I don't know. In the now obsolete "blue" hymnal, I almost invariably steer away from the hymns that draw their provenance from the early 1980s. While I'm typically down with their theology, the lyrics feel like First Church of Portlandia earnest progressivism, and the "new tunes" tend towards lnoodly, indistinct abstraction. I'll reserve judgment about the new new stuff until a copy lands in my hands, though. I was musing about our pursuit of new music and the place of the old during the last week, when I had a conversation with my thirteen year old about forgotten songs. Because even as the old hymns fall away in a wash of Christian Contemporary Music, other music is also fading. As we drove to his drum class, he connected his iPod to our car radio, then scanned through the artists. He'd been comparing playlists with his friends at school, particularly one he'd just put together of some of his favorite artists. He's the fruit of my loins, and that means he's a bit of a mutant, so the playlist in question was entitled "'Nam,"
'Nam? Shoot. I was five years old when Saigon fell. Such an old soul, he can be. But list was appropriately named, a compilation of his favorite artists from the 1960s and 1970s. None of my friends knew any of these musicians, he said, a bit put out. They'd never even heard of them. He panned down the list of names that bear no meaning for his peers. Crosby, Stills, Nash, and Young. Creedence Clearwater Revival. Janis Joplin. Jimi Hendrix. Meaningless. You could be making those names up, and his friends wouldn't know the difference. Not even Hendrix, I asked? Nope. And then, as if to drive the dagger deeper, he said, and none of them had ever even heard of Pink Floyd. It's music that is receding, an increasingly distant ship's smoke on the horizon. That may change as they grow older, and their base of knowledge expands. I mean, shoot, I'm not sure I'd ever heard any CCR when I was 13 beyond ads for KTEL compilations. But then again, it may not. Those tunes may fade into obscurity. As human beings have learned to store and keep music, and recordings have become part of our collective memory, the volume of our musical memory just keeps expanding. Even if you've got complex tastes and an appreciation for the sounds of other generations, there's only so much we can know. And so we move on, and we forget. Sometimes, that's for the best. But sometimes, it means we lose track of our context, and drift away from stories and songs better not forgotten. Dust in the wind, I suppose.